From wheat grown without reliance on artificial chemicals and fertilisers. Good FoodBaked in the heart of the Scottish Highlands, these deliciously rich and crumbly all butter shortbread biscuits are made using the finest ingredients: churned British butter and British wheat flour including flour from wheat grown on Duchy Home Farm at Highgrove. The shortbread triangles fit together to form a circle that echoes the shape of the pieces of fabric used to make a full-gored petticoat during the Elizabethan era. Good FarmingOrganic farming works with nature using methods such as crop rotation and clover planting to build fertility in the soil. 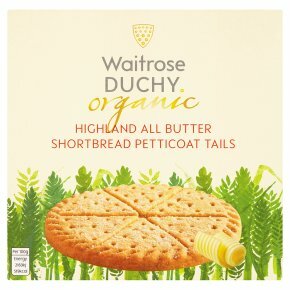 Good CausesSales of Waitrose Duchy Organic products provide a donation to The Prince of Wales's Charitable Foundation. This year, over £2.5m will be donated to the Foundation, supporting good causes across the UK. Since 2009, you've helped to raise over £17m for initiatives such as the Duchy Future Farming Programme, which helps farmers develop more sustainable farming practices. Baked in the heart of the Scottish Highlands, these deliciously rich and crumbly all butter shortbread biscuits are made using the finest ingredients: churned British butter and British wheat flour including flour from wheat grown on Duchy Home Farm at Highgrove. The shortbread triangles fit together to form a circle that echoes the shape of the pieces of fabric used to make a full-gored petticoat during the Elizabethan era.